There was a time in my life that I thought I would never become a mom. And that was okay.. because I was already a mom to my adorable white chubby pomeranian we named, Duke. He is the whole world to us. And though I have my Camilla Claudette now, he remains to be our first born, our Kuya, the one that provides us utmost happiness. I can't tell how how many time Duke gave balance into our lives. If not for him, I don't think R and I would have lasted this long. He is our four-legged miracle. When Marj invited me for a photoshoot for the to celebrate National Dog Day with Pet Angel and The Purple Groom, I had to say yes! Any excuse to spend time with my eldest baby is always welcome. The Purple Groom has been our dog groomer for more than five years now. I remember Jayme's dad calling to us when we saw that our then-grooming salon was closed. He told us that we should give them a try. Duke has a special cut that we love so much so when Jayme's dad assured us that one of our groomers can do exactly that, we obliged. And we've been a patron ever since! We've been a frequent customers, we are practically friends with all the their groomers. If you're in Tiendesitas, look for Aries. He does the best bearcut for Poms! But I can't take Aries home with me and that's where Pet Angel comes into play. 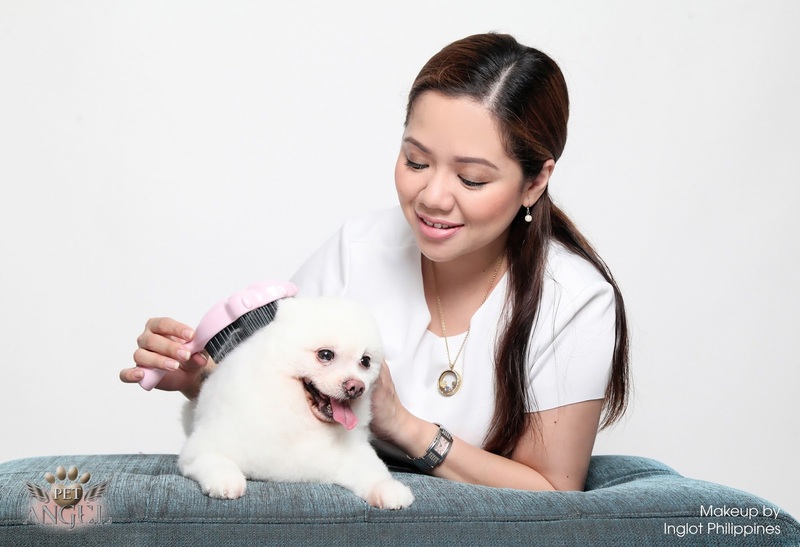 Pet Angel is from the company that brought the phenomenal Tangle Angel brush that many A-listers celebs are using! When I used Pet Angel, it was the brush made for the very complex fur of my lovely Pomeranian. Duke would usually cry out when I go deep in brushing his fur and untangling and Pet Angel did a splendid job at untangling the base hair which is thick. The contoured base is exactly what I needed to give my dog a more pleasant experience while I unravel the tangle. Another feature I like is that it's anti-bacterial! If you hate cleaning brushes (they are impossible) then you don't have to worry about Pet Angel. I have been looking for a brush like this for a long time that would take care of my dogs' fur and I think I found it with Pet Angel. The great thing is that it also eases the burden from my groomer to put pressure on my Duke and Cleo. The less tangle and matting they have to deal with, the more pleasant grooming will be for my pets. And who won't love the paw-shaped brush? So, yes, Pet Angel is slighty expensive (Approx. P900). But it is one of a kind and will definitely go along way than those horrid wire brushes that are potentially harmful against your dog's delicate skin. Brushing Duke and Cleo is always a great way to spend time with them! 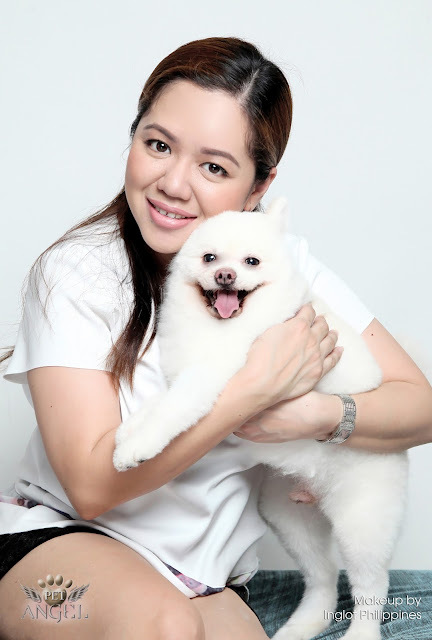 Thank you, Pet Angel Philippines and The Purple Groom, for this fun shoot to celebrate my first born, Duke! Here are some behind the scene photos Nikki took during my shoot. Look how behave duke was! I'm such a proud momma! So don't brush this off! Give Pet Angel a try! For sure, your pet will love it! Pet Angel is available in selected Browhaus(SM Megamall Fashion Hall, Greenbelt 5). Follow them on intagram @TangleAngelPh and their facebook page, Tangle Angel Philippines. The Purple Groom is located at Pet Village, Tiendesitas, Katipunan Ave., and California Garden Square. They have more branches, check their faccebook page, Purple Groom.